A pattern is the base of garments manufacturing. The pattern set as per garments shrinkage and sewing allowance. Single or two/three sets of the pattern can be made for same garments lot. The only objective of creating a different pattern is to keep accurate measurement as per buyer requirement. 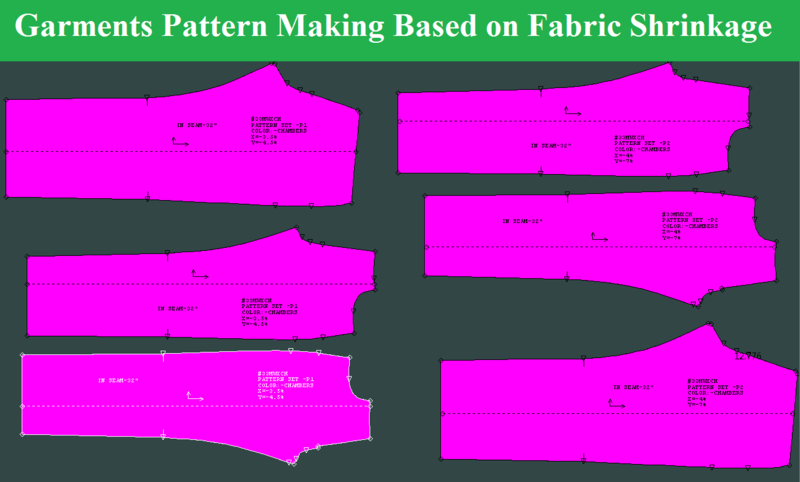 Hope this article will give you a clear idea of how garments pattern making based on fabric shrinkage is done for ensuring measurement accuracy. Garments pattern is very sensitive to keep accurate garments fittings and measurement. First garments maker has to find out fabric shrinkage. Based on shrinkage garments manufacturer have to make the pattern. Certain rules are followed when shrinkage difference is >2%, >3% or >4% group rolls of similar shrinkage, different patterns must be made for a lot if shrinkage difference crosses the acceptable limit. Otherwise, a single pattern is made for a lot when shrinkage difference not crossed the certain limit. Need to do proper shrinkage and keep record accordingly. After making the record, garments maker segregate the shrinkage per group and range like -2% to 8%, maker must need to make 2%-5% one group and 6%-8% another one group. As per the shrinkage group, the manufacturer makes a separate pattern with the group shrinkage and will put the pattern numbering like P1, P2, etc. The pattern group will depend on how many shrinkage groups they have been found on fabric. Also, need to maintain the fabric category to make the pattern per shrinkage group. Before wash measurement is complete garments measurement just before washing (if wash product). When the CAD section will adjust the “0” pattern per shrinkage % and will be identified by the numbering P1 or P2, per the shrinkage group the CAD section will make the before wash measurement spec to verify garments measurement in before wash stage. It sends to the sewing section to check the measurement. During sewing stage garments maker need to do 100% garments measurement as per the CAD section has given before wash spec and Quality Control (QC) Manager need to verify the report. If found out of tolerance GMTS in Sewing in-process comparing with before wash spec, need to find out the reason of out of tolerance occurrence, to be taken preventive action and will be recorded in the file with measurement sheet. Tagged Before Wash Measurement Spec, Before Wash Spec, Before Wash Specification, Corrective Action on Measurement, During sewing need corrective action to prevent the measurement problems, fabric shrinkage, Fabrics Shrinkage, Garments Measurement, garments pattern, Garments Pattern Making Based on Fabric Shrinkage, Group Pattern, Group Shrinkage, Make Group Pattern, make the pattern, Measure Garments in Sewing Stage, Measurement in Sewing, Pattern Creation, Pattern Making, Pattern Making Rules, Stages of Different Pattern Making in Same Lot of Garments.